This new pattern is amazing! 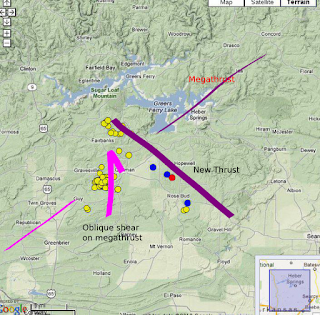 In fifty years (ten if they inject), the thrust zone (middle) is going to fill NW-SE to the rift walls (red lines). As we know, this area is an amazing overprint of a failed rift on top of the megathrusts. What a mess! If it fills to the edges, then the shear zones will be out of the old stress shadow, and I think we can expect something like an M8. We don't really need injection here since it is slurping directly from the river. This is a really good article. You'd almost want to pay for it! (ha, ha). This is probably a consequence of the current fad of 'uprating' a nuclear plant. They jammed in a few hundred more tubes into the steam generator, and left out some stabilizing plates to make room. The thing shook itself apart. The same thing happened at Darlington (vibration), and that's why they are going to replace everything. Maybe the new steam generators will last as long as these Callie ones. :) I don't think they can build these things as well as they used to, and I'm sure the Darlington vibration always gets worse as things loosen up. 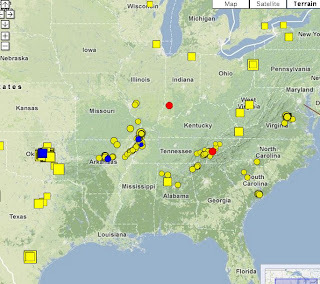 We have 3 small earthquakes in the US, none of which we can blame on injection (maybe). 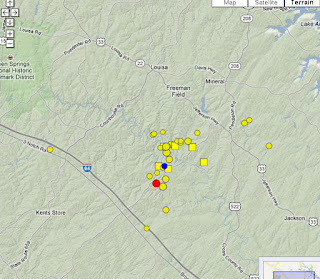 The first is an M2.8 right in the middle of the OK aftershock zone. 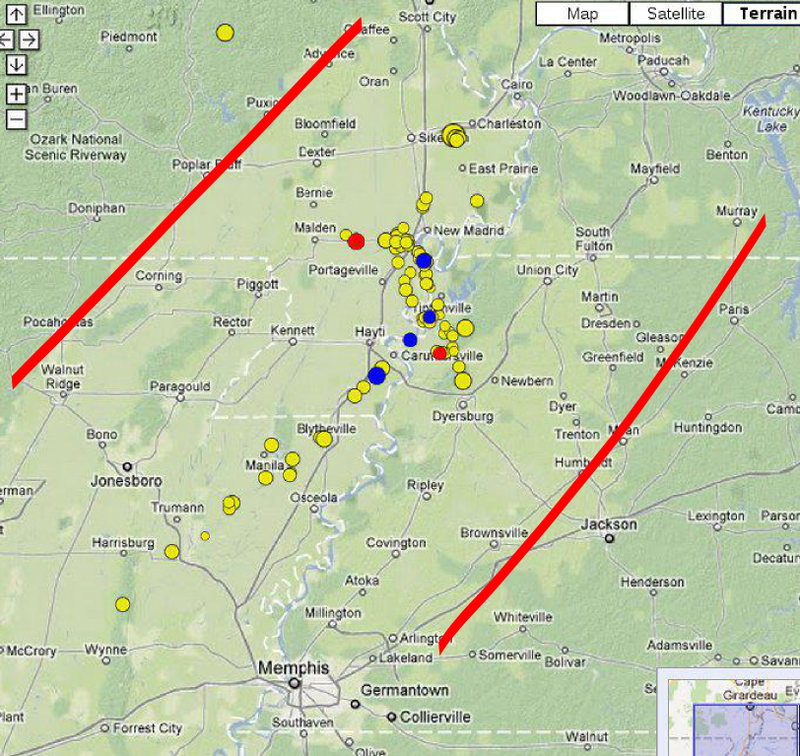 The next 2 are in the middle of the New Madrid mess, which could be considered aftershocks of the big one. I like to think they are part of the next quake, but they are interesting only if they extend the zone. 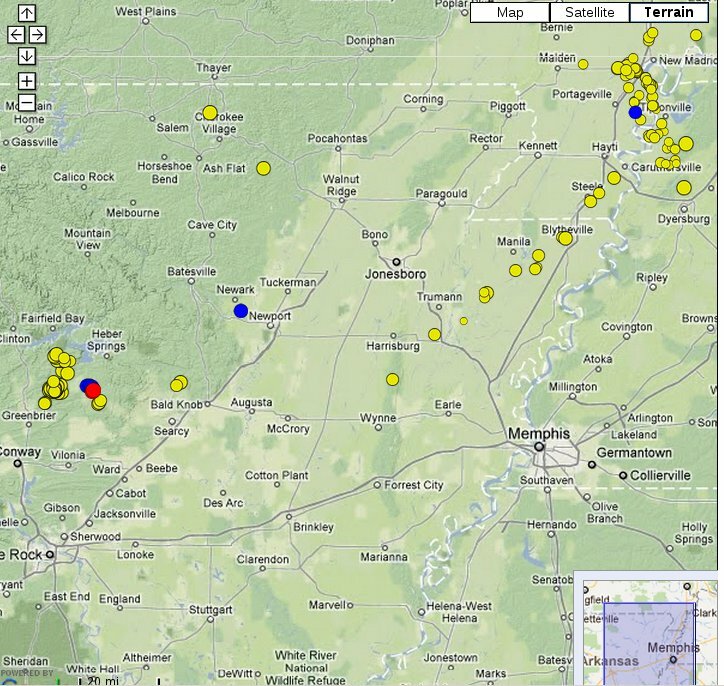 Like I've said, more earthquakes extending the line to Dyersburg would be infinitely more interesting. At least some people are! 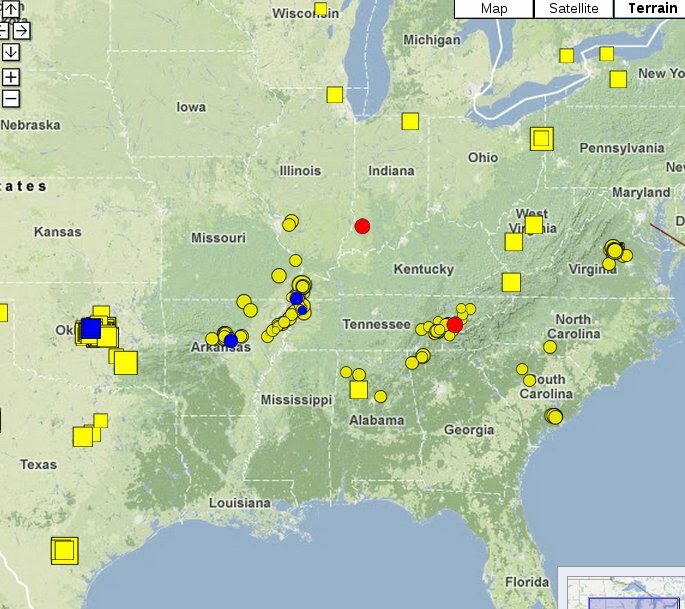 Ohio has gone off the map for injection earthquakes, when it used to have so many. Where's the spirit of adventure? :) Ohio has the same megathrust as Toronto, and I was sort of using them to calculate the odds of a big earthquake there, but I find now Ohio may have cheated with the injection. All of their M5+'s are probably injection, and that means Toronto must have a lower chance for fireworks. More or less. They've been gabbing forever, and every time they flap their lips, it comes out 10 times more expensive. I think it's somewhat like New Orleans, where it keeps sinking, and they are helpless if another hurricane hits. Christchurch is the same with earthquakes. So far, everybody has followed the rule of 'Take the money and run', which is perfectly reasonable. Obviously the gov't is pissed off, since they want to make all this money back in future taxes. So now it's Catch-22, with the gov't saying they won't give money until the economy picks up,.... and you know the rest. Really, you can't build on soup in earthquake country. Even if you put your new hotel on piles, you've got all the roads, sewers, water, etc., that will be souped out in an earthquake. Like I said before, they need a new city designed for soup. Everything on piles, and all services in tunnels on piles, with the roads on top of that. When the next earthquake hits, just fill in the sunken ground. Had they done this, I think it would have been going faster, for less cost. Yeah, the AP1000 is on the final list, and they finally realized they can only fit 2 of them on the Darlington postage stamp site. You will recall that I was the only one laughing at their nattering of jamming 4 reactors right beside an active monster quarry (lots of blasting). And what the heck is an 'Enhanced Candu 6"? Have they bumped up the 30 year old 'Banana Republic Special' from a hamster-wheel 600 to 1000 MW? That defies physics! And you know how I feel about that! So far I've been right, except about the timing. I was expecting to have the darn things built by now! I was going to make lots of money doing the seismic! Right now they aren't doing any seismic and I really wonder whether the old C-6 design is much better than some ancient designs we know - Pickering -- cough! Update: Sorry, they aim to jam 4 hamster wheels on the site in comparison to 2 AP1000's. Ten times the labour to run, but what the hey! 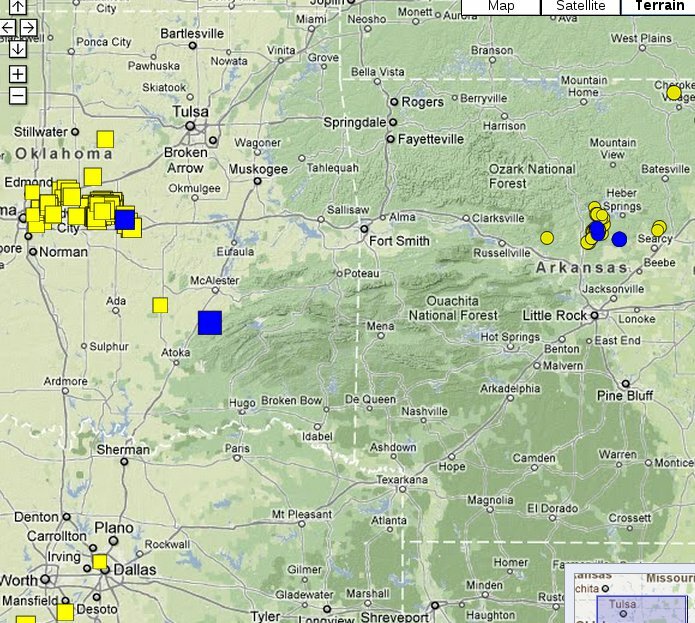 Wow, nothing happened on the earthquake front! I was in Montreal again. We got an Internet special with a funky, modern hotel - Hotel Opus. Valet parking free for hybrids! As you know, I'm the kept husband, so I was the bag-boy driver for this, while the spoose was changing the world. So I was sitting in the lobby reading, due to the horrendous weather, when they start auditions for some crazy French version of Price is Right. I found it hard to pretend to read, as these characters in costumes paraded in front of me. It is soooo boring without an earthquake in Okieland. Luckily I never have to wait long. Like I said before, this is filling in a Toronto pattern, so we should expect more earthquakes to line along the main fault, and some more M5+'s in the disturbed zone. Now for Arkansas! Why do I read that differently than anybody else? 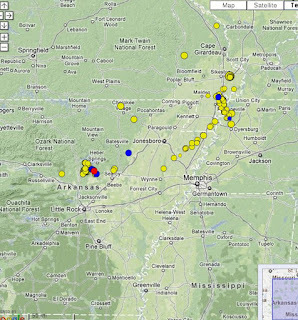 Anyway this shows that Arkansas may have just restricted injection at the original site, and that other spots are active. Injection will only be stopped if you have something totally obvious. I still think it can set up large earthquakes if injection is done on a large scale, and there may not be these obvious warnings. Lots of fun yet to come! "This is part of a growing number of cases of earthquakes caused by fluid injection — and if it was found to be linked, this would be the largest," said Steve Horton, a research scientist at the University of Memphis's Center for Earthquake Research and Information. Speaking for the industry, Richard Moorman, CEO of Canadian company Tamboran Resources which has permits to operate in Northern Ireland, said that fracking is "perfectly safe if properly regulated", and that in his experience of fracking in Arkansas, US, accidents occurred at a low rate of one in every thousand drilling operations. Well, truly, there is no great risk in fracking itself. The article makes no mention of the disposal of fracking water. Perhaps it is best to dump it into the sea? Update: All the newspapers have now gone with the angle "Fracking does not cause significant earthquakes." But what if you are only person in the world who believes it does exist. What can you do? The first thing is to not view it as a static thing in a static stress field, it is a dynamic thing. Then you've got something to work with. Basically, the new developments in Arkansas have led to my latest inspiration. Generally unstable Precambrian crust under high horizontal stress, NW direction more than twice as much as the NE direction. The Precambrian is riddled with many faults and large through-going fault systems. Where it has proven to be a soft and yielding base, it has caused extensive fracturing in the upper Paleozoics (limestones, shales). The PC is composed of silicates (granites, etc). It can only be called 'stable' by some in that nothing hardly ever happens. The water in this crust has been sitting there for millions of years and has corroded everything it can. Thus, it is saturated and can have no further effect on the rock. Along comes a disturbance. 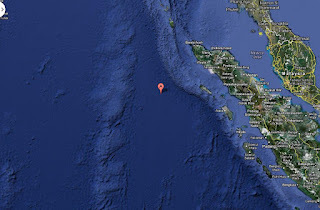 This is mainly in the form of a new source of water, probably from glacial epochs, or shifts in rivers. A disturbance must start small. 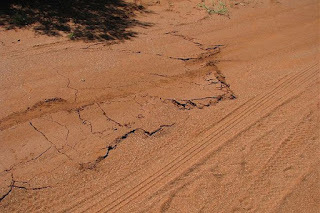 It is not conceivable that a large fault system suddenly appears, like that meteor strike. A conjugate set starts exactly as Arkansas did. 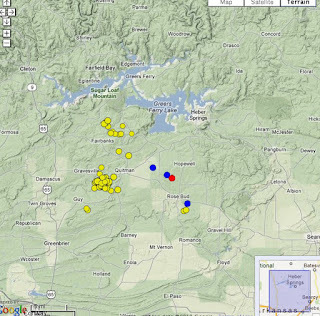 You have a disturbance, in this case injection, and you have earthquakes along a NW trending structure. These are thrust earthquakes, reacting to the main horizontal stress. You can only go so far before you have compressed a zone, and are causing shear strain along a NE trending vertical plane. 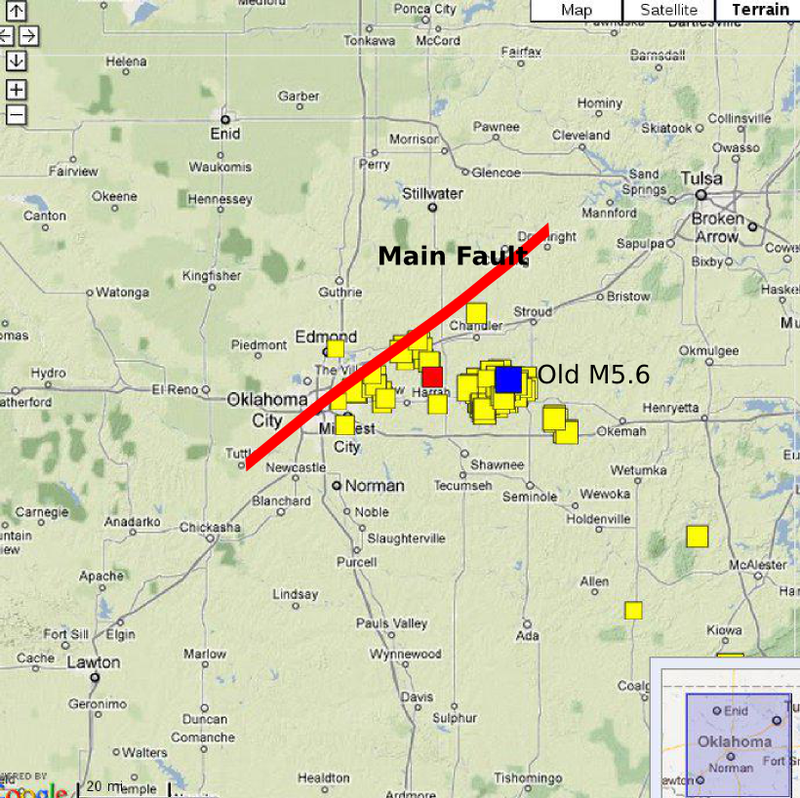 At this point the shear (strike-slip) earthquakes start. This was on a very long line from the original thrust zone. The whole thing is driven by water infiltration and silicate stress corrosion. So, how can this grow? 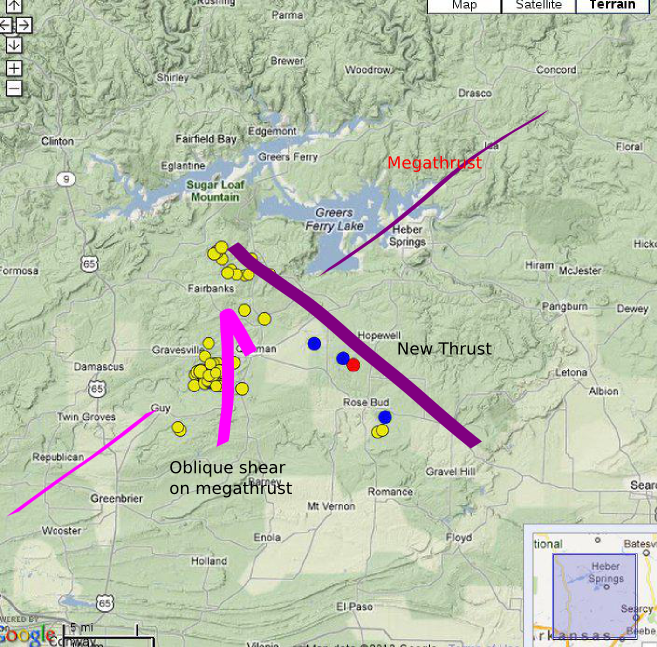 The thrust zone could get larger, and maybe a second small shear wing, but this configuration must die. 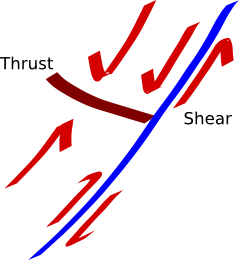 My suspicion is that one of the shear wings takes over (the upper one in this case) and the whole initial system becomes one shear. The combinations of the shears and thrusts become one big oblique shear up the slope of the megathrust. Thus the original complex is swallowed by the new system. If the new thrust is successful, it will again throw off new shear wings, as with New Madrid. Wow! They should be able to dismiss this one as a mere aftershock. That's what I would do. Red spot at the lower left. I can't really believe this. It must be some injection outside their phoney boundary. If such a strong line were to be really developing this fast, it would be a new thrust fault, giving away totally on its own. 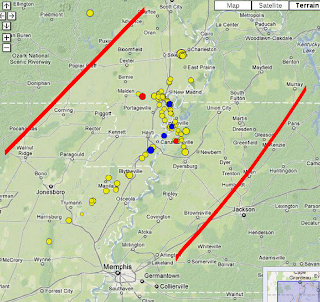 I included the New Madrid zone to show how its thrust zone is parallel. A conjugate fault set is the only one that signals a larger earthquake, since the growth is so clear. When I talk about these things I expect them to develop over a very long time, not weeks. The ideal way to make lots of money in the injection biz is to punch through to the Precambrian, and find one of the 'magic holes' where you just have to pour the stuff down by the truckload. These things only exist in the hanging wall of the megathrust. Toronto has this pattern, with the potential M7 under Hamilton. 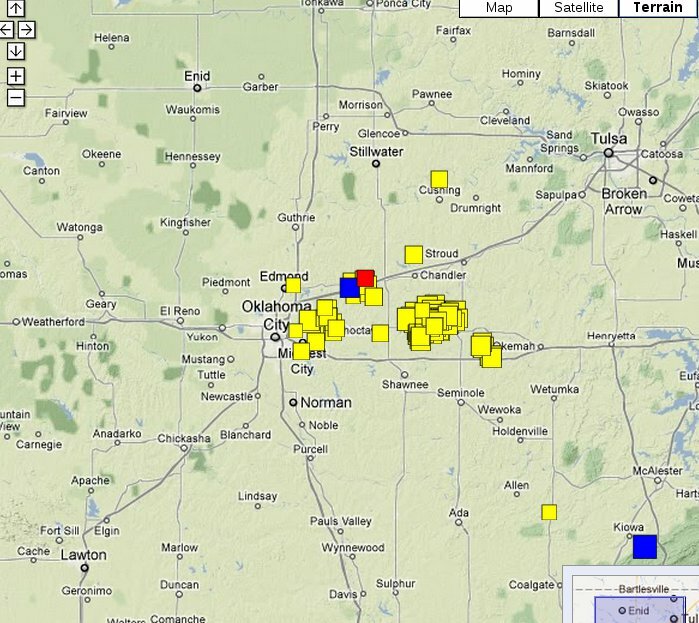 Now Oklahoma is developing the same pattern, not due to a Great Lake, but rather, massive injection. Don't forget that Toronto has been recording since 1991, and who knows what they have in OK! But I really think the pattern will fill in. I don't really want to qualify with the odds, etc. I don't think anybody will read this. 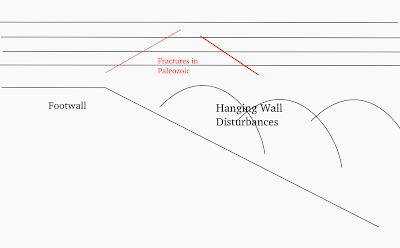 But the most interesting scientific point is whether activity in the outer disturbed zone actually contributes to the sustaining mechanism of the main fault. 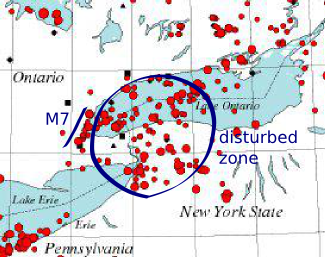 For Toronto, I used to think that this outer zone was a passive result (disturbance) of activity on the main fault. This is something like mining. With OK, I am coming around to the opinion that it is a double feedback. Every earthquake in the zone converts NE main stress to a NW strain, which pushes on the main fault. The actual sustaining mechanism is thus the entire thing! This is an entirely different mechanism than New Madrid and little growing Arkansas. All brought on by injection -- It's fantastic! This is in a new cluster. Note the more rugged national forests, since I believe these are along the 'spine' of the megathrust. OK is such a mess now with disturbed stress that perhaps there won't be another big one. Who knows? Afterthought: It's quite possible that with lots of injection that this will resemble the Toronto pattern, with the major fault under Ok City, and a disturbed hanging wall to the east. I expect that things will remain fractal up to M6 or M7. That is, the usual curve of 10 M3's for an M4, etc. So, I really thought that Arkansas was done when they stopped the original injection. Problem is that they narrowly defined the 'prohibited' area, and I don't know how that maps out. The original zone is the cluster to the SW corner. 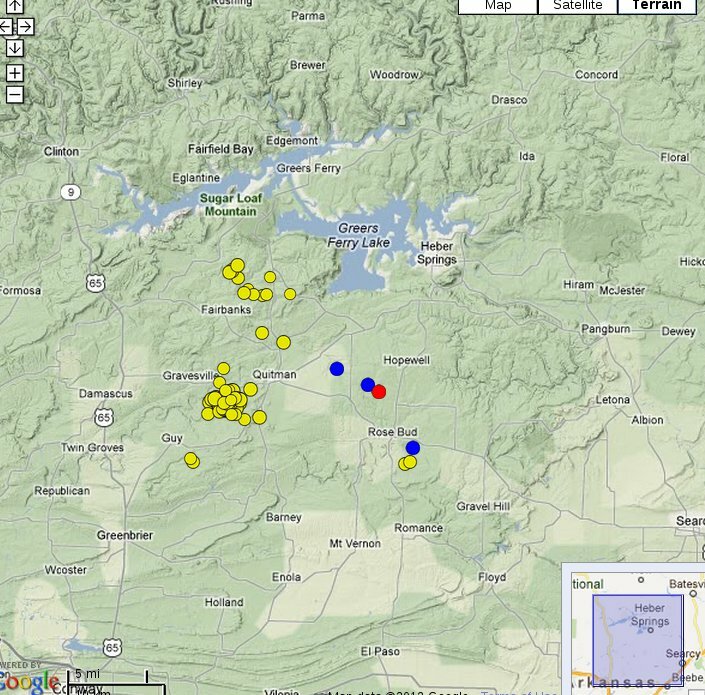 A new cluster near the lake then appeared, and I thought we were looking forward to some typical dam induced earthquakes. Now, we have this long NW line forming. As we know, the NW line is the main driver behind the New Madrid zone. The big megathrusts are all NE, but the main horizontal stress is also along the ridges of these things, since there is stress relief when the faults shift. A NW trending thrust fault extracts the strain energy in this direction, but I am unsure how these things form. I suspect that there were 'adjustment' faults in a conjugate set to the megathrusts, just like there is adjustment at the kinks in the subduction zones (site of one of the recent Mexico earthquakes). 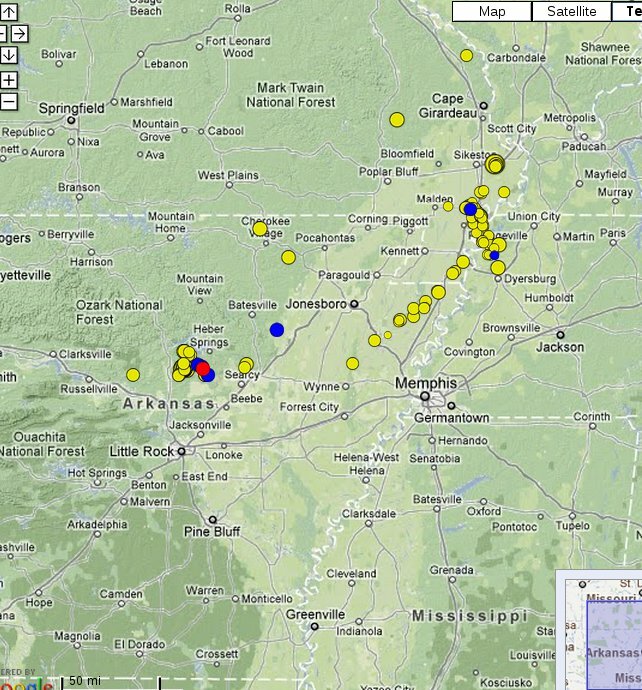 The Arkansas sequence started in a NW line and then developed shear wings just like New Madrid. This gives it infinitely more potential to grow than an Oklahoma or Virginia mechanism. 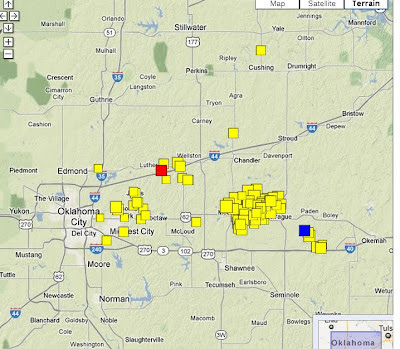 So the latest quakes are either on their own, or they have broken out of the 'containment' zone. Either way, we are seeing the birth of a New-New Madrid! Yeah, the 2 gov't earthquake people left may get some money! Looks like there may be a Canadian study. 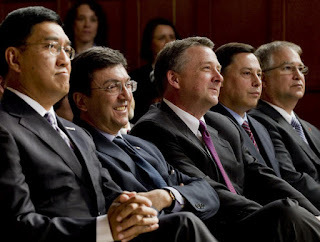 Trouble is that they're all seismologists, people who didn't get math in high school. (joking!). Really, not much action in Canada, don't know what they'll do. Real action is in the US but all their geology is broken up by State, so they'll never figure it out. 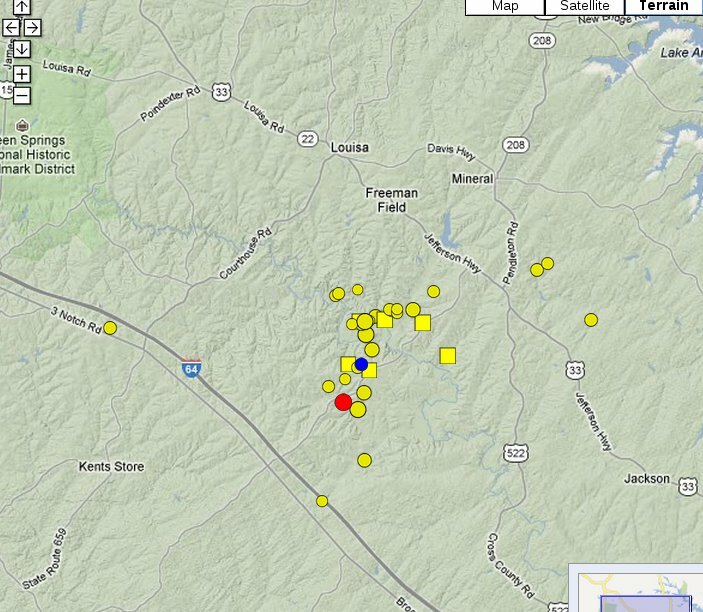 As mentioned earlier, I had predicted that this was a very shallow earthquake. That's the only way the physics makes sense. The rock is under very high horizontal stress and they never had major glaciation to munge up the surface. In Canada, we had something similar up in northern Labrador. Nothing to worry about! Old boys will save the Ontario economy! I'm not going to ride on this too much, since it depresses me. Suffice to say that all the young 'thinkers' that I have known have been forced (enticed?) to go to San Francisco or New York. Any university graduates remaining can't find jobs. Rationally, I think that all the old boys are trying to milk the entire economy, and control all thinking, since that could be dangerous! :) Reminds me of Facebook destroying Instagram, but in Ontario this is done before ideas even get out the door. 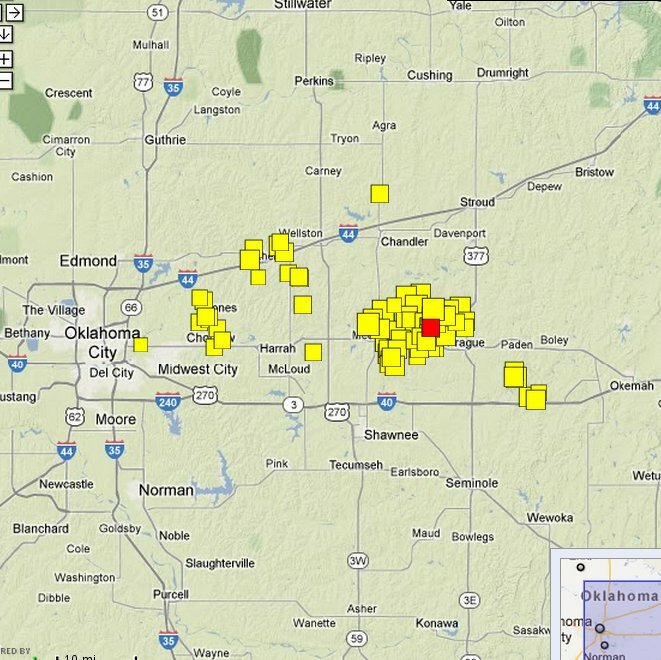 Heck of a lot of earthquakes! Wow, I'm not blogging on each and every one of these M8+'s rattling around the Pacific. They really are nothing for most of the area, except California. Most likely this cluster doesn't mean anything, since it is natural for random events to present clusters. It is very unlikely that these events would be spread exactly evenly. This latest one in the Gulf of California could be interesting, since this is near the southern tip of the San Andreas and could start a new March of Earthquakes up the line. Not a great chance. 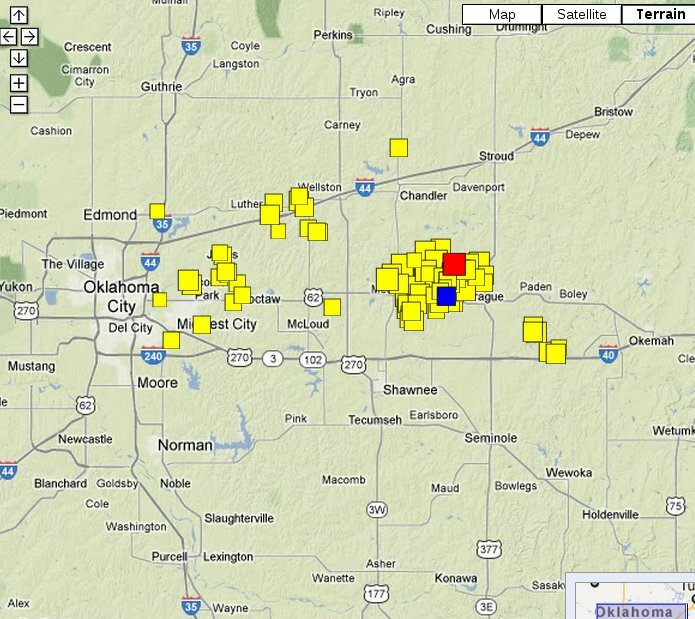 Update: Another M3.1 earthquake in Oklahoma. Who cares? 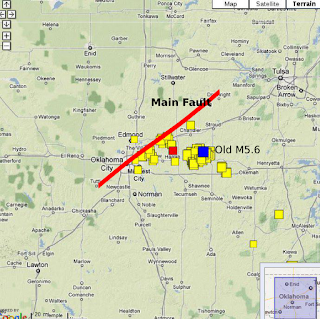 Since Ohio went all wussy on injection earthquakes, I was expecting the next big action to be in Indiana. They are right on the line. 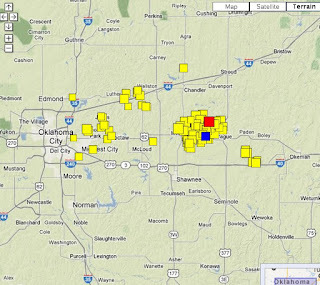 These are their oil and gas wells. 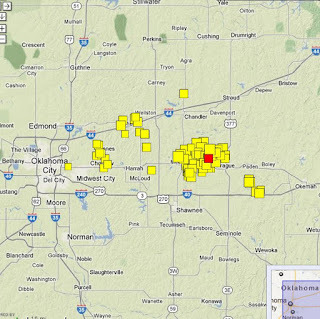 I couldn't find a map of Class II injection wells, but there are over 2000 of these things. Now, one earthquake does not a party make, but I'm expecting more! 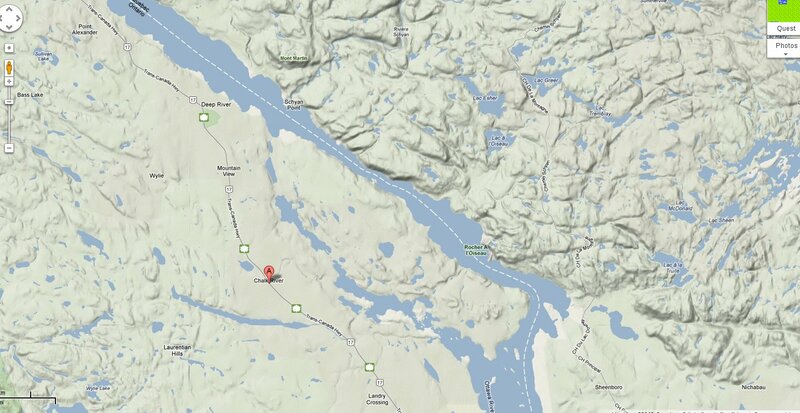 They need to find the major fracture zone in the Precambrian, and dump in truckloads! 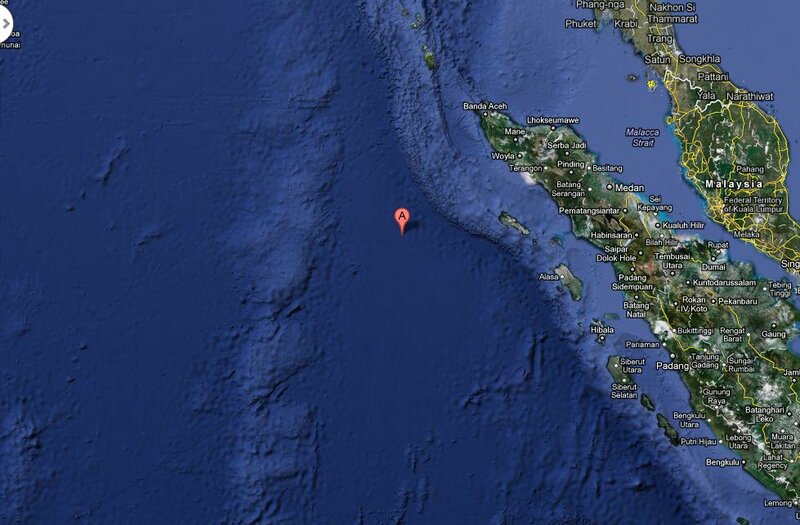 It's hard to think of this size of earthquake being 'minor', but it really is in this part of the world. This earthquake is 4 times shorter than an M9, and is apparently strike-slip. It's those weird bends in the subduction zones. They stop the major rips, and then things have to work through them. Eventually, it opens up for the next big rip to the south, which will also be an M9+. One of the world's largest funders of science is to throw its weight behind a growing campaign to break the stranglehold of academic journals and allow all research papers to be shared online. Nearly 9,000 researchers have already signed up to a boycott of journals that restrict free sharing as part of a campaign dubbed the "academic spring" by supporters due to its potential for revolutionising the spread of knowledge. People may wonder why, when it comes to earthquakes, I am 'All Hat and No Cattle'. Two things: first, getting references is intensely boring, and second, there's nothing this side of the Pay Wall. 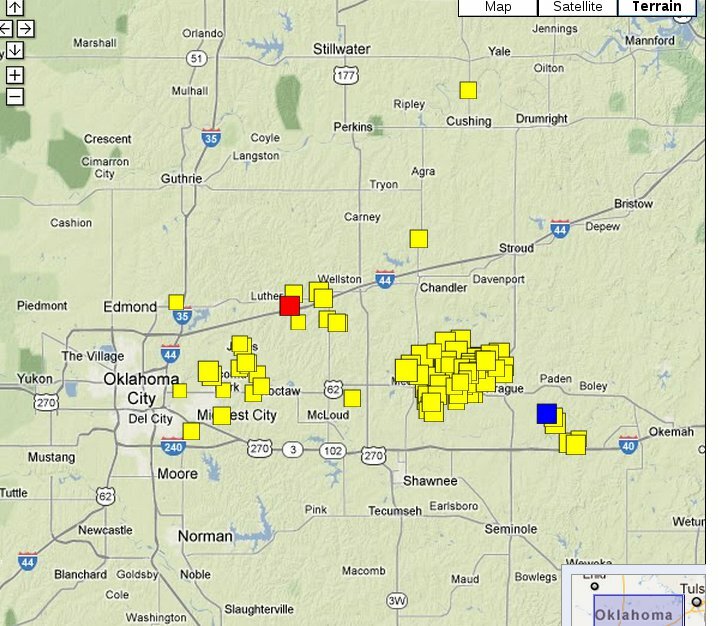 It is unlikely that all of Oklahoma's recent earthquake clusters can be attributed to human activities, state geologist G. Randy Keller says in a position statement released Monday. I love it when people use the old 'all' argument. It's been used against me thousands of times (surely not thousands!). When I make a statement, I turn it to an absolute if it is 80-90% true. 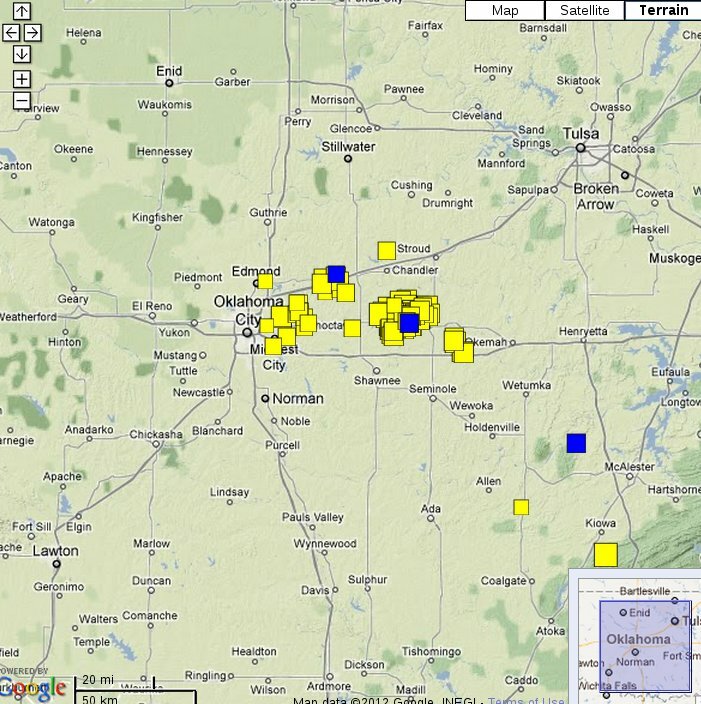 Thus, I would state that 'all' of these earthquakes are injection. Somebody can attack that statement by using the rare exception. That is why scientists never say anything interesting, because their opposition might go down to less than 1%, or one in a million! Statements always have to be couched in a zillion qualifications. Now that they are sucked up by Facebook, I decided to put this out. 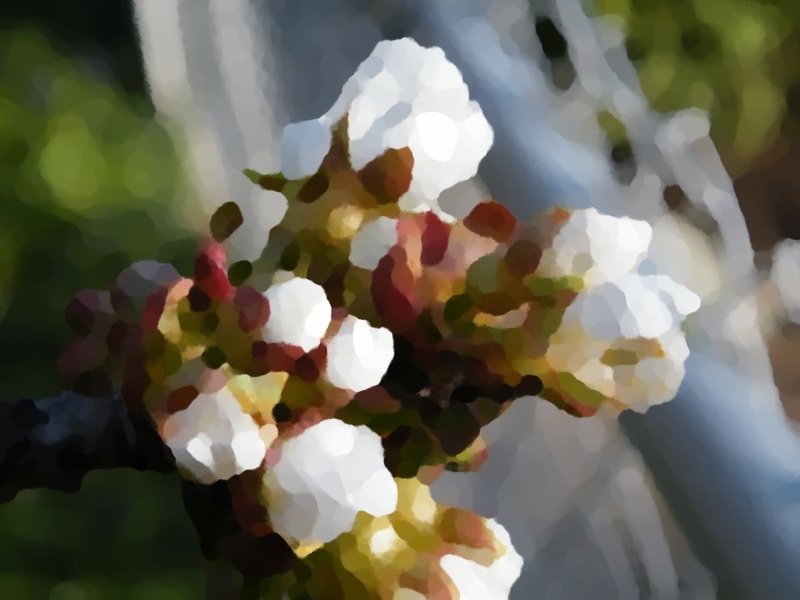 We did an Easter Hunt for the big kids yesterday, and I made up the clues by taking pictures and going to town with Gimp photo filters. These are new cherry blossoms, with Oilify. The 'treasure' was money, what else? 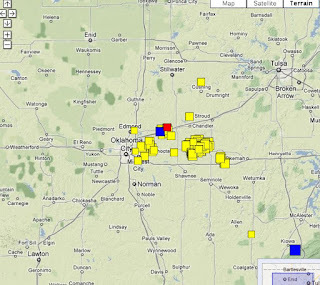 So many earthquakes that I should just summarize them weekly. Ok has become the new Calie, nobody notices these things any more. 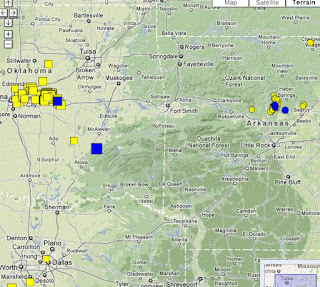 I still don't think they have good seismometer coverage, and the patterns seem unusual. We should expect these earthquakes to get bigger and bigger, but the whole thing is such a dog's breakfast, I just don't know. Those who have been reading here for a while would realize that I'm a bit of an old grouch, who never wants to do anything. Well, Saturday was beautiful, and the rest of the family wanted to do something. With everybody running around, it is difficult to get a majority of kids in one spot, but we decided to tour Niagara from Toronto. I am a hardened Toronto person, and my experience with Niagara is taking relatives on tours. The crowds are unbelievable, so naturally I tried to gloomy my way out of this. No chance! We first visited Niagara-on-the-Lake, after driving through all the empty vineyards. A bit brown.... But the girls loved the shopping, and my daughter got some good stuff for her Thailand trip. We had a very nice lunch, and the whole place is not very expensive, compared to the big city. A very nice drive along the parkway to the Falls. We stopped at Riverview Cellars for a wine tasting, and bought 2 bottles of white. They have a very nice ice wine which tastes like strawberries and would well with chocolate, but we aren't ice wine fans. Everybody keeps giving us bottles! They barely were able to make a harvest this year, during the only cold 3 days we had! The falls area was an absolute zoo, but we drove through slowly and had a nice view. The local parking is $18, and looked full. I went nuts and we kept driving. However, we found free parking on top near the Casino, and went for a walk. The view was much better since there was major water, and the mist was thick. Much better pictures. Went to the Fallsview Casino. Most amazing that they sucked us in with an immediate $30 win at the slots. We walked out with a $60 loss, but it was interesting. It's funny how none of us feel the slightest pull in that place. 30 years ago, Los Vegas was much more interesting with the continuous fall of coins clinking away. Now, it's all paper tickets. Update: All pictures on my daughters new blog. Hot on the heels of the USGS epiphany, we have this M3.3 in another cluster in the Shaky State. This would be in the footwall of the big M6, so it is virgin territory, in terms of stress. We should easily get ourselves another M6 out of this! Now it's not only me casting aspersions at the sanity of Okly-Doklies. Now the Big Boys are doing it too! As we have been aware, the USGS is a totally Big Sur affair when it comes to earthquakes. Really, do they want to live in Okie-Land? So, only glamorous things get them out of their hot-tubs. 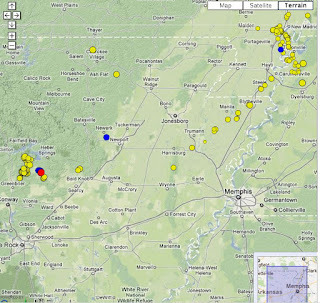 All these injection earthquakes are starting to do it. This is just for California, but I would love to extend it east of the Rockies (ENA). 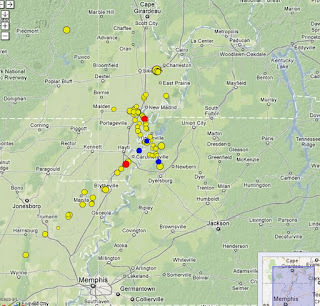 As we know from the Virginia earthquake, we have a history of random M6's going off anywhere at any time. They pop off every few years in ENA, but as individuals we are protected by a vast area. Thus the odds of being significantly hit by such an earthquake might be 1 in 100 per year, that is, rolling two 10-sided dice each year and getting snake eyes! These really don't do much except knock down brick chimneys and crack brick houses on swamps. When such a thing happens on the Hamilton fault, I expect lots of local damage, and the power to be out for a day or two. Everybody there should have an earthquake kit! For the rest of the GTA I just want one thing: Don't flood out of the buildings for such an earthquake! The streets are far more dangerous. This is difficult, since we know these things activate fire alarms. So, the big money will go into manual overrides for earthquake-induced fire alarms. All these alarms will also drive the fire department nuts! 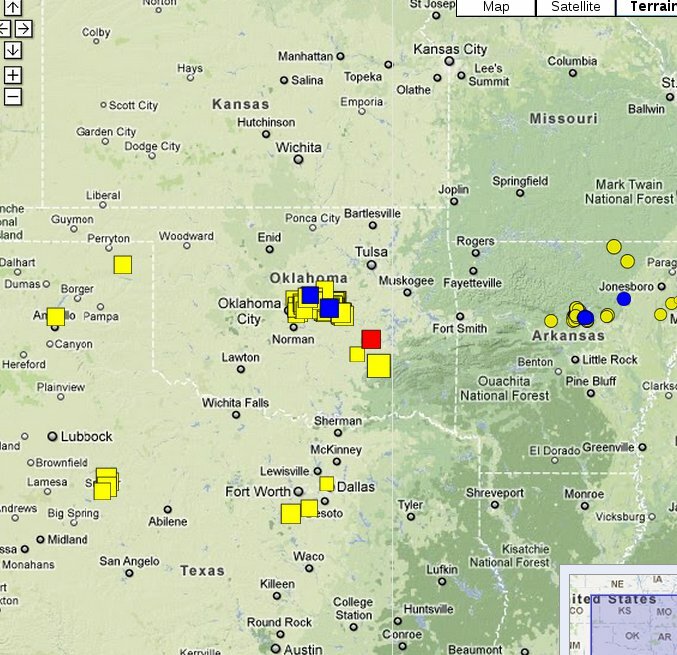 After watching trucks thrown a few hundred feet in Texas, perhaps it is hard to get excited about earthquakes. Ok had an M4 in the middle of nowhere (big square). We can assume it is injection but we await more to be sure. 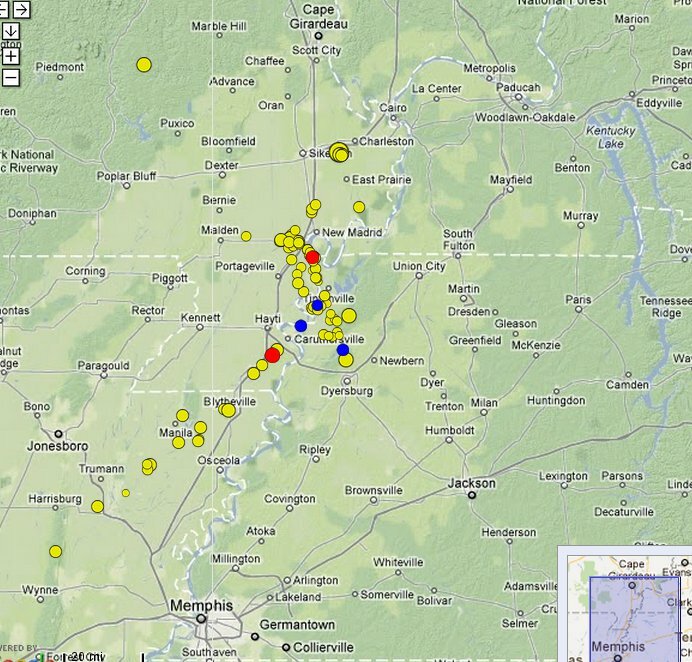 Virginia had an M2.5 at the lower edge of the earthquake zone. If this trend continues, we are seeing some sort of extension of the zone which is most likely brought around by natural fluids. 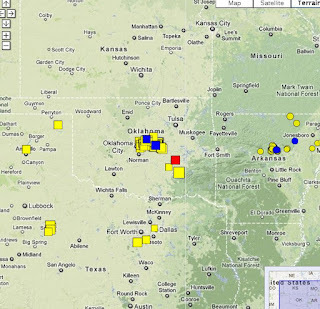 Note that Arkansas continues with low activity. It came up again, yesterday. I thought it was another joke! The site is straight towards the river from the town. 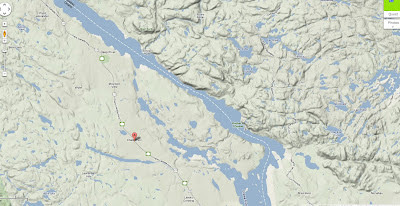 Note that beautiful fault along the river! As we can see, the site is built as well as Christchurch, with the same seismic capacity of 20 cm/s. 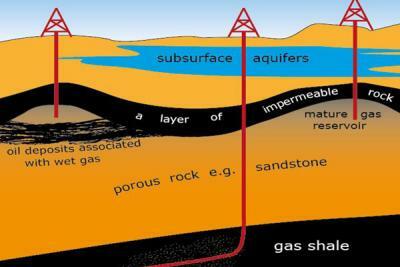 I really don't want to go on about the geology, since they will find out when they drill. As with Bruce, the fun part will be seeing how they find one little hunk of solid rock, and saying that the site is perfect! We all await! Well, after many weeks, I feel I can release the essential truth of this sad incident (with lots added). We live in a country of cosy monopolies. World businesses like Nortel and Rim soon fall in flames. In order to exist, these monopolies throw an 'invisibility shield' around themselves, and reporters soon give up. The worst of these is the nuclear business. Every once in a while, a brand new reporter decides to become cannon fodder. This is her story. We shall call her The Little Match Girl or Lim for short. Lim was a product of the cheap tuition Canadian university system which turns out lots of graduates, with no chance for a job. Faced with no hope of a paying job, she entered the most dying profession of all - Journalism. So Lim huddled in her unheated flat, grasping at stories nobody else wanted, and one came up: the anniversary great Japan earthquake and nuclear wipe-out. The premise was that the Canadian nuclear industry was just as closed and sloppy as Japan before the quake. Using her boundless energy, she attacked the System with all legal means and came up with one sheet of paper, which hinted at intense sloppiness, but was old, and could easily be denied. She called up a wild blogger who said the paper was probably worthless. 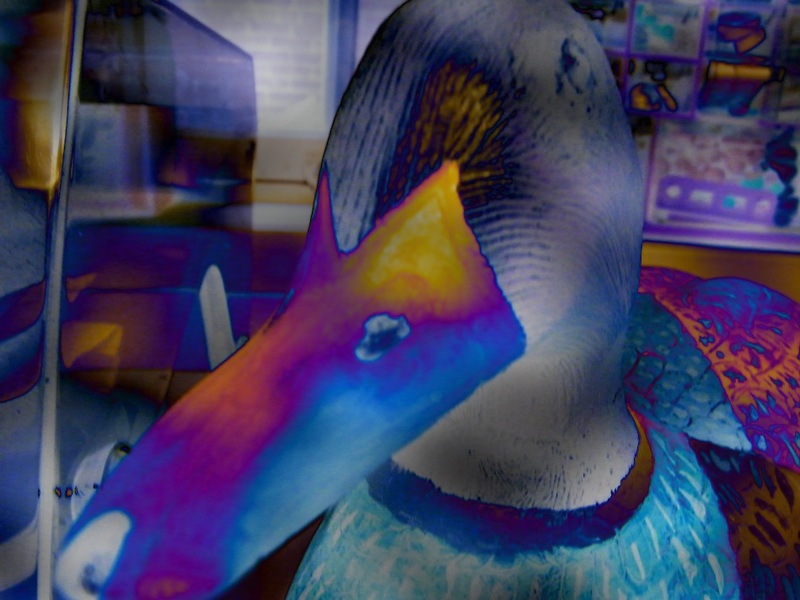 She became infected with his claims of nuclear shenanigans, and still decided to take her story to the great doors of the Canadian Timid Media.